Jerome Ponce asked, "Anong gusto mong gawin ko? Kalimutan na lang lahat?" Elisse Joson told her ex-boyfriend: "Because wala na, Jerome." Pinoy Big Brother: Lucky Season 7 housemate Elisse Joson closes another chapter in her life after settling things with ex-boyfriend Jerome Ponce. Last night, August 2, Pinoy Big Brother aired Elisse and Jerome's talk about their relationship. Jerome entered the PBB House in Vietnam as a houseguest, hoping to pursue a second chance with Elisse. Before going out to the garden to talk to Jerome, Elisse entered the confession room where Kuya gave her a letter from her ex-boyfriend. Jerome's letter reads: "I really miss you a lot. And still now nothing has changed. I know you are confused/mad/afraid. But I’m here now, given ng chance, time, destiny ng some people around us. I hope I can talk to you this time." Kuya gave her an hour to decide but before the allotted time, Elisse said yes. "Gusto ko pong ipakita naman na hindi lang sa commercial po yung babae na yun," referring to the "hugot girl" who moved on in a viral fast food commercial. She continued, "Hindi lang po dahil may script yung commercial na yun kaya naipakita po yung storya ng babae sa commercial. Gusto ko rin pong mapakita especially sa sarili ko na kaya ko rin po yun bilang ako po. Na in order to move forward, I have to set peace with my past." Elisse was obviously nervous at the start of their conversation but kept her emotions in check as she continued talking with her ex-boyfriend. Jerome started, "Weeks before nito, kino-compose ko ang sarili ko gabi-gabi. Hindi ko alam kung anong sasabihin ko sa iyo. Ito na iyong gusto mo, hindi ba?" The 21-year-old actor told Elisse that he plans to talk to her mom and say sorry for what happened. Jerome told Elisse, "Makikipag-ayos lang ako sa mama mo, e, magso-sorry lang ako ng maayos. Kung hindi niya kayang tanggapin." He continued, "I want to say sorry para alam kong matanggap niya ako ulit." The PBB celebrity housemate replied, "I don't think she will and I'm okay now." Elisse then asked why Jerome wants to talk to her. The Be Careful With My Heart actor answered, "Kasi ganun kita ka-gusto so at least let me 'cause this is just me." Jerome finally asked the big question: "Gusto mo pa ba? Masaya ka pa ba?" However, Elisse felt otherwise and said, "I'm trying to make you understand, it's not the same as before. Kung before to nangyari, I will be happy. The thing is, it's different now." She added, "Things have changed." Their conversation became even more intense when Jerome frankly asked, "Anong gusto mong gawin ko? Kalimutan na lang lahat?" to which Elisse answered, "Because wala na, Jerome." Elisse further clarified that she is now moving forward from their failed relationship. She admmited, "I don't want you to give what you're giving [me] now kasi hindi ko na kayang tanggapin kung ano man yung ginagawa mo now. Sana before, lahat ng ginagawa mo ngayon, yun na, yun na yung guy that I could ask for. It's just that hindi na ngayon, sana noon." 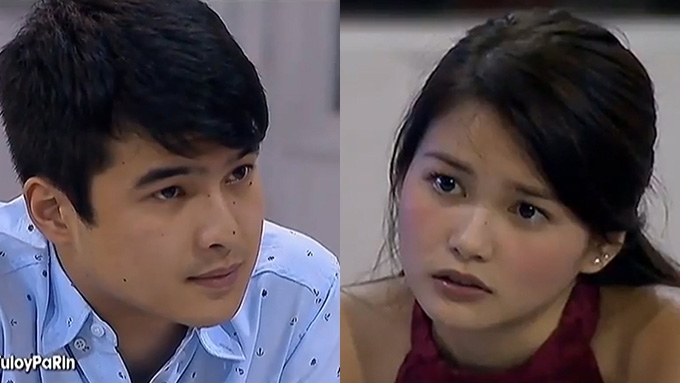 The former couple's conversation then focused on Jerome's plan to say sorry to Elisse's mother. In a separate interview with Big Brother, Jerome felt that Elisse's mother, Barbie Joson, still hates him. He said, "She hates me Kuya, sobra. Feeling ko po kasi siguro pati siya iniwan ko bilang itinuring kong ina at itinuring akong anak." Elisse said it would give her peace of mind if ever her mother would accept her ex-bf's apology. The 20-year-old actress/commercial model told Jerome, "I'd be really happy kung pinatawad ka niya, kasi part din yun ng peace of mind ko." Towards the end of the conversation, Elisse clarified her relationship with Jerome wasn't all bad. "I want them to think na just because hindi nag-work yung ibang bagay at may mga nasaktan, it doesn't mean you're never good to me," the Star Magic talent said. Elisse added, "I think we will be good friends."